I lead the way to the cellar, passing the rose garden and through the arcades. “I came many time to play with those games while visiting, never knew about the cellar.” Marlon is now all excited about the discovery to come. 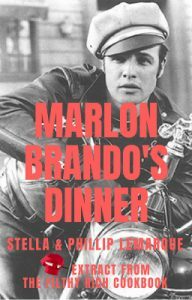 Read the full story in our special “Extravagant Marlon Brando’s Dinner.” which includes the menu and all the recipes to each of the courses of this Extravagant Dinner.